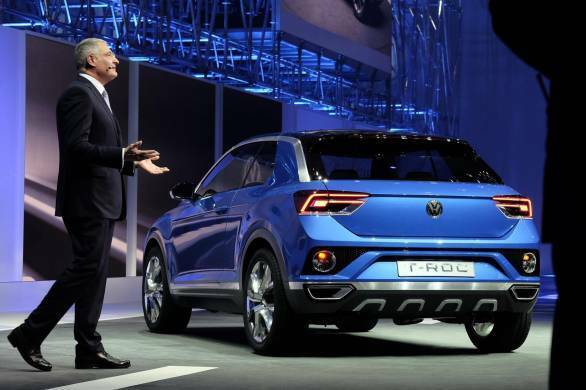 Volkswagen has revealed the T-Roc concept in Geneva and announced that this three-door, Golf platform-based crossover is on its way to being a production model. This targa-topped baby SUV is among a series of new offerings planned by Volkswagen, which has been hit by its limited lineup. The T-ROC's roof can be taken off, essentially transforming this targa-topped into a convertible. This targa-topped baby SUV is among a series of new offerings planned by Volkswagen, which has been hit by its limited lineup. The Taigun and the Multivan Alltrack MUV, which is also being showcased at the auto show, are two other products in Volkswagen's pipeline. The T-Roc's roof can be taken off, essentially transforming this targa-topped into a convertible. The car shown at Geneva is likely to be production ready as it does not use any exclusive or exquisite materials in its construction and should be relatively easy to produce if Volkswagen wishes for that to happen. During the presentation in Geneva  Volkswagen pointed out that the powertrain options can be any one from the Golf range which includes plug-in hybrid, electric and gasoline variants. At the unveiling, the company officials said, "We would like to build the T-Roc, as it's the logical consequence of the Golf format." The concept shown has a 2.0litre four-cylinder TDI engine producing 184PS of max power and 380Nm of torque. Transmission comes in the form of 7-speed dual clutch gearbox sending power to all the wheels. Volkswagen concept car provides preview of new SUV range Wolfsburg, 3 March 2014  On the evening before the Geneva International Motor Show the Volkswagen Group traditionally presents its highlights. 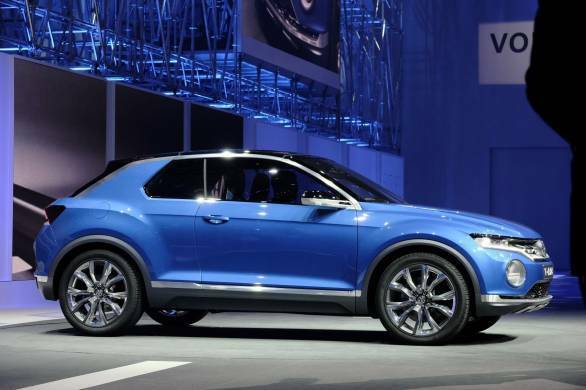 With the world première of the T-ROC concept car the Volkswagen brand is giving a preview of a possible SUV range. The striking features of the concept car include its progressive design, the front section with the LED headlights and two removable roof halves. With the Tiguan and Touareg Volkswagen has in its model range two of the most successful SUVs (sports utility vehicles) of European origin. In the future, Germany's largest car manufacturer will be expanding this spectrum appreciably with new models in a variety of classes. Coming up at the Geneva International Motor Show (4th to 16th March): the world première of the T-ROC, a Golf-format concept car positioned a step down from the Tiguan. 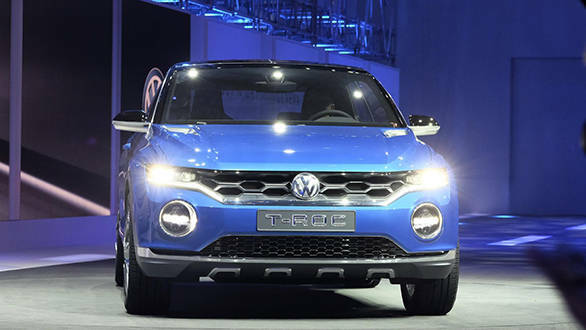 Following the CrossBlue (USA), CrossBlue Coupé (China) and also Taigun (India) concept cars, Volkswagen is once again giving a look ahead to possible future SUV models. The T-ROC follows a new design line and interior style, with the progressive design of the front section being particularly striking. The two-door vehicle also combines the talents of an all-wheel drive SUV - which doesn't capitulate even when faced with rocky off-road tracks - with the summery airiness of a convertible. The middle section of the roof consists of two halves that with just a few flicks can be taken off and stowed in the boot. Front and rear cameras, which are backed up in the dark by LED headlights, extend the driver's field of vision. Powered by a 135 kW / 184 PS turbo-diesel direct injection engine, the T-ROC is equipped with three different driving modes: 'Street', 'Off-road' and 'Snow'. The parameters of the 4Motion drive train, 7-speed DSG (dual-clutch gearbox), ABS, Hill Start Assist and Hill Descent Control vary depending on the mode selected. The 2.0 TDI engine's fuel consumption is a low 4.9 l/100 km, while maximum torque is 380 Nm. The vehicle body has been designed based on the Modular Transverse Matrix (MQB). Thanks to lightweight construction the SUV weighsjust 1,420 kg. Visually striking features include the relatively short overhangs and the multi-part 19-inch alloy wheels with size 245/45 tyres.